A common belief of Financial Planners is that retirees may need 75% of pre-retirement income to meet their retirement needs. But according to Statistic Canada data the average household expenditure by a Seniors’ household is 52% of that of middle-aged households. 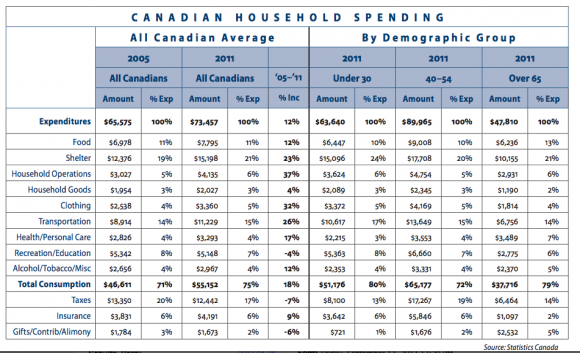 In 2011, the average household expenditure for a household headed by a person aged 40-54 was $89,965. This drops to $47,810 for households headed by a person 65 or older. While spending drops dramatically for the average Seniors’ household, the mix of spending does not tend to change significantly. As a percentage of wallet, allocations to food, health and gifts are relatively higher for seniors, while taxes and insurance are lower. Regardless, it is quite evident that government payments (Canada Pension Plan, Old Age Security, Guaranteed Income Supplement) may not be enough to meet the spending needs of the average Seniors’ household. 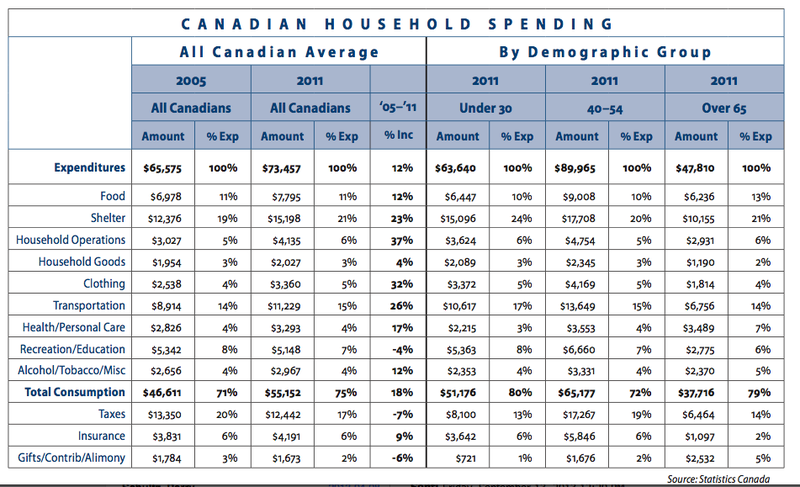 The chart compares average Canadian expenditure levels in 2005 to 2011. Over the six-year period, average household spending increased 12%, from $65,575 to $73,457. It is important to note that over the same period the “official” CPI inflation increase was also 12%. Now it gets interesting. Few of us believe inflation is really running at the official CPI level. Why? Because how we spend is different than how the CPI is calculated. As consumers, wallet share is more important than a statistician’s version of a basket of goods. The share of wallet dedicated to total consumption went up 18% during the 2005-2011 period, led by the largest expenditures – shelter, household operations (internet, child care, for example), and transportation. The negative offset was taxes, but no one ever believes taxes go down! When spending is further broken down by age demographics, interesting trends appear. For example, it is interesting how much the younger (under 30) households pay for shelter (24% of all expenditures). Should interest rates go up, this real cost implies a reduction may have to come from somewhere else. The portfolio implications of the above reinforce an emphasis on maintaining a growing stream of income going into and through the retirement years. The fact remains that household budgets have been hit hard by the relatively benign reported inflation over the past six years. Two percent inflation over a 20-year period is an almost 50% increase in the price level. This may be the largest risk faced by Canadians entering retirement. With yields in excess of 3% and dividend growth over 5%, LFA portfolios offer a combination of income and growth to help meet return requirements for decades. Read more. Where does our money go?